Get Noticed. World-Class Marketing that moves your home from Listed to Sold. When it comes to customer satisfaction, KoenigRubloff numbers speak for themselves. Our professionalism, service and quality set us apart from the rest, and ensure that you will have a terrific real estate experience. TELL US WHAT YOU THINK Youâ&#x20AC;&#x2122;ll receive a survey invitation email about two days after your closing from Real Satisfied, an independent rating service. Look for the survey, and take this opportunity to share your experience. WORKING FOR YOU A real estate broker takes your home from listing to closing, playing many roles. A fiduciary responsibility to you is the foundation, and you can expect market expertise, guidance, responsiveness, loyalty, disclosure and accountability at all times. WORLD CLASS MARKETING A blend of art and science, our marketing platform combines technology with a personal touch. Hathaway HomeServices name represents you well. Our distinctive cabernet and white signs convey quality to capture the attention of prospective buyers. BEAUTIFUL BROCHURES & MARKETING PIECES The story of your home unfolds in beautiful, four page property brochures, created for each property. These full-color pieces make a lasting impression. DIRECT MARKETING ECARDS	Instant communication of new listings, open houses and updates.  Cards are one of the most effective ways to e communicate new listings, open houses and other important information quickly and to a targeted audience. POSTCARDS	Stunning direct mail, targeted for results. Beautiful property postcards can be a great way to spread the word. Direct mail can be employed to reach a highly targeted audience and achieve maximum results. Award-winning contemporary 4 bedroom, 3.5 bath brick home designed by internationallyrecognized architect on wide lot in coveted Bell School. Innovative home with expansive wall-to-wall windows in front and rear. Refined detailing and substantial materials are used to achieve flawless execution in design. Arclinea and Gaggenau stainless steel kitchen, modern spa bathrooms, green garage roof deck, private courtyard and superior finishes throughout. 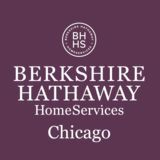 DIGITAL REAL ESTATE BERKSHIREHATHAWAYHS.COM A global destination for home buyers Across the country and around the world, buyers trust the Berkshire Hathaway HomeServices name. Real-time traffic data and Inside Accessâ&#x201E;˘ neighborhood and price history reports make this one of the fastest growing home search destinations. Thinking of selling? Estimate your home value based on sophisticated analysis of real estate and public data. KOENIGRUBLOFF.COM The local real estate resource The source for local real estate search, attracting more than 100,000 desktop visits and 25,000 mobile visits each month. Intuitive search, detailed maps and intelligent filters transform listing data into home finding intelligence. PROPERTY WEB ADDRESS Your online address is the focal point of our marketing A unique web address connects buyers with compelling information and beautiful images of your home. Rich local details give buyers an in-depth view of the schools and neighborhood amenities. Buyers can easily save properties to an online portfolio, contact the agent or share via social media. ENHANCED ONLINE MARKETING Millions of consumers use national real estate sites and mobile apps. To capture this highly engaged group, KoenigRubloff enhances our listings and data streams on the most popular digital real estate destinations. YOUTUBE AOL.COM *Subject to change. Our automated marketing systems puts your property video on YouTube and creates animated content for social media sites like Instagram and Facebook. Instagram is one of the fastest growing social sites, with more than 1 billion people using the platform each month. DĂŠcor, style and culture content are a perfect backdrop for KoenigRubloff listings. YOUTUBE One third of all people online use YouTube. And, Google search results rank videos above traditional websites. Our property videos reach a mobile and digital buyer audience on this important platform. Slideshow videos are automatically created for homes, making it easy for our agents to share new listings, open houses, price improvements and successful sales. NEXTDOOR.COM Nextdoor is the private social network created for neighborhoods and neighbors. The site has quickly become a valued resource for sharing information about vendors, services and local activity. KoenigRubloff listings are shown in their Nextdoor neighborhoods, linked directly to the property detail page on KoenigRubloff.com. Nextdoor members are highly engaged in their communities, creating quality leads. Nextdoor is in 89% of US neighborhoods and has more than 12 million unique visitors each month. Automatic for KoenigRubloff listings; no cost to our brokers and clients. DIGITAL | RETARGETING & MOBILE ADS Using innovative advertising networks like AdWerx and Chalk Digital, we extend the reach of traditional real estate advertising. AdWerx takes online ads beyond the real estate sites . A vast network of news and information websites including CNN.com, ESPN.com, Amazon.com and hundreds more*. Sophisticated retargeting keeps ads in front of the most engaged consumers. Mobile app advertising is the fastest growing advertising segment. Chalk Digital campaigns deliver in-app ads to consumers in hypertargeted locations, through a network of 36,000 mobile apps. Geofencing rules specify where and when ads are strategically distributed to consumers in real time. *Includes all residential, condominium, townhome, single family, single family detached, ranch over $200K. Websites subject to change. ÂŠ 2016 BHH Affiliates, LLC. Real Estate Brokerage Services are offered through the network member franchisees of BHH Affiliates, LLC. Most franchisees are independently owned and operated. Berkshire Hathaway HomeServices and the Berkshire Hathaway HomeServices symbol are registered service marks of HomeServices of America, Inc.ÂŽ Equal Housing Opportunity. JUWAI.COM Advertising on Juwai.com reaches a targeted audience of 2 million af fluent Chinese consumers. By partnering with a site that is behind the Chinese firewall, Berkshire Hathaway HomeServices brings our listings to a previously hard-to-reach market of potential buyers. The site displays our properties, along with branded advertising. A click-to-translate program makes it easy to contact an agent in the United States. In 2016, mainland Chinese outbound property investments surpassed $1 billion. The United States is the top destination for Chinese property investments. FINANCIAL TIMES OF LONDON One of the most important global financial news sources, Financial Times of London has an audience of 650,000 affluent online users. This influential site places your home in front of potential buyers in London and across Europe. 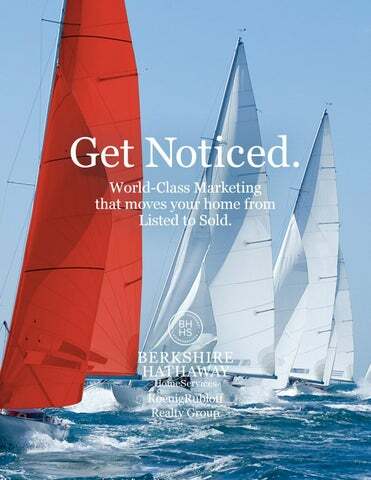 All Berkshire Hathaway HomeServices residential listings are exposed to a sophisticated international audience on the siteâ&#x20AC;&#x2122;s Featured Properties page. Source: FinancialTimes.com, 2017. Attached and Detached property types. World-Class Marketing that moves your home from Listed to Sold. FOREST & BLUFF ULTIMATE ADDRESS LUXURY COLLECTION MAGAZINE HARBOR COUNTRY NEWS THE REAL ESTATE GUIDE WEDNESDAY JOURNAL INDEPENDENT NEWSPAPERS We provide your home with maximum exposure to the ideal audience. Tapping into the local marketplace, we are present in the communities that we live in and love. Our television commercials are seen via a highly targeted TV buy across HGTV national cable programming. Social Media delivers the most up-to-date information regarding our communities and the marketplace. LISTING UPDATES KOENIGRUBLOFF EDGE REPORT Timely metrics about your home keep you informed throughout the marketing process. Our KoenigRubloff Edge Report provides a weekly detailed report of web traffic on the most popular real estate destinations. Youâ&#x20AC;&#x2122;ll see how many people are finding and viewing your home. MARKETING UPDATES SELLER ADVANTAGE REPORTS Seller Advantage is an exclusive market activity report that details buyersâ&#x20AC;&#x2122; search activity on the Berkshire Hathaway national website, so you can see how our network is working for you. *Source: 2018 The National Association of RealtorsÂ® Profile of Home Buyers and Sellers. How Were You Introduced to the Home You Ultimately Purchased? POSITIONING YOUR HOME IN THE MARKET KoenigRubloff agents do a thorough analysis of your local market to help determine the value of your home. By setting the asking price at the fair market price, your home is seen by the largest possible audience as it is introduced to the market. A property gets maximum interest during the first few days. Listing at the best price, rather than trying a higher price, ensures that a home is marketed to the right group of buyers. GETTING YOUR HOME READY Enhance Your Home Before You List. Make it easy for potential buyers to envision their belongings in your home!